In this tutorial, we present a method to render Golaem Crowd simulations with Katana and Arnold or Renderman. 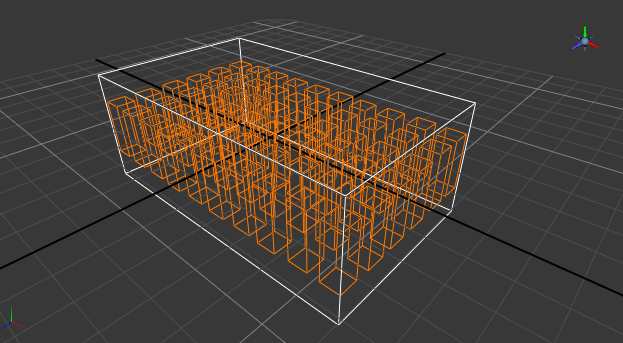 The really big advantage of this method is that it uses the procedural rendering (saving a lot of space and enabling to customize shading and asset repartition after simulation) in Katana. The figure below details the workflow of the render of Golaem Crowd simulations with Katana. For a better understanding of the process, check the Golaem Crowd Rendering Workflow. 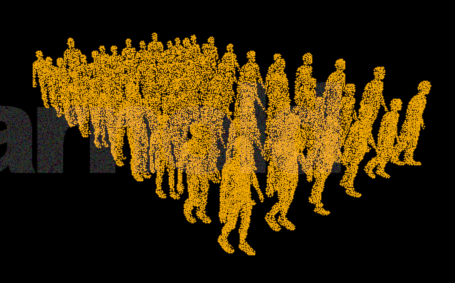 Create your Crowd Simulation within Maya using Golaem Crowd. In our example we will use the stadium scene from the Golaem Crowd Samples. Once the simulation is done, open the Simulation Exporter to export the Simulation Cache. 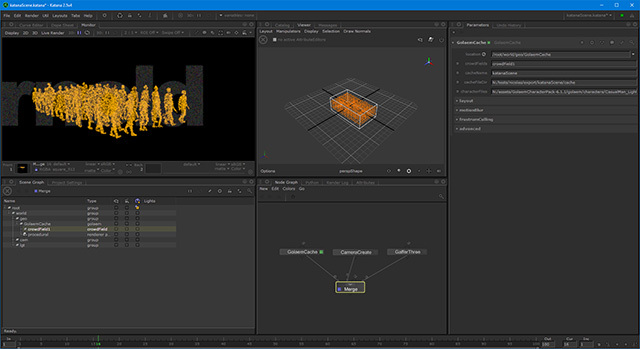 Once the Simulation Cache will be exported, a Simulation Cache Proxy and a Crowd Render Proxy node will be created and Golaem will be switched in Cache Replay Mode. .
cacheName.proxyNodeName.xml which stores all the parameter values of the Crowd Render Proxy required to render exported Simulation Caches as Crowd Characters. Details about this .xml file can be found here. A few steps must be undertaken for Katana to be able to load and render with the Golaem plugin. Then, for Katana to be able to find the Golaem For Katana Plugin, its path needs to be added to the predefined KATANA_RESOURCES environment variable. Depending on the used rendering engine, it is also required to define where can be found the Golaem for Arnold and Renderman plugins. There are many ways to add a path to an environment variable, however for our test, we chose to create a bat / shell file to launch Katana with the correct environment. A GolaemCache op node is a Katana GeolibOp node which handles the display and the rendering of a Golaem Crowd simulation in Katana. It can be created from the Node Graph panel by pressing the TAB key. To define the values of the parameters of a GolaemCache node, one can use the Shelf Action "Feed a GolaemCacheOp node from a XML file" attached to the node and load a previously exported Katana .xml file. This will fill all the values of a node with the values from Maya. 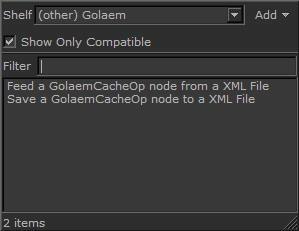 Once the Katana .xml file is loaded, the attributes of the GolaemCache node will be automatically filled according to the content of the file. They now can be edited to change the rendering results (motion blur properties, subdivision attributes...). 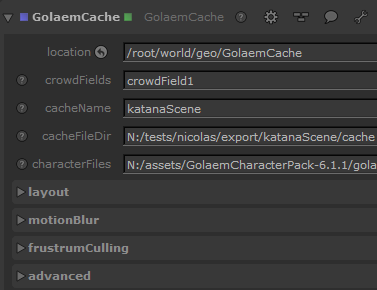 The GolaemCache node attributes are the same than the Maya Crowd Render Proxy. When you're happy with everything, render with Katana and you're done! Notice that this method has the same properties than rendering inside of Maya. It means that it supports 3d motion blur, displacement, frustum culling, subdivision surfaces, shading variation, render passes... More here. From Renderman For Katana 22.1, you just have to create your Materials in the scene graph location specified in the materialsPrefix attribute of the GolaemCache node (root/materials per default) and name them the same way than in the Character File within the Character Maker in Maya. All parameters relative to the Crowd Render Proxy (motion blur, frustum culling, subdivision, visibility...) can be changed directly on the Katana Golaem node. The actual transformation and scale of the node in the Katana scene is also taken into account. If you'd like to change any Crowd Shader properties (texture, color, displacement, multi matte IDs...), it can be done on the assigned Materials in Katana (see above). Finally, if you'd like to change the assets repartition or the shading assignment, it must be done in the Character Maker in Maya. When done, you just need to save the changes in the Character File. Reexporting the .xml file is not required.